This page covers the Bitswift Decentralized Asset Exchange and its use cases. The asset exchange allows users to exchange digital assets existing within the Bitswift blockchain platform directly with each other in a decentralized manner. The asset exchange is safe and secure as the tokens being exchanged never leave the end users control and do not need to be trusted or held be any 3rd party such as a centralized exchange. The asset exchange could be used to exchange Bitswift assets with other Ardor child chain assets such as those found on Ignis chain. Asset Exchange: This tab gives you access to the Asset Exchange itself. To observe an asset click the "Add asset" button and enter either the Asset ID or ID of the issuing account. Assets of your interest will be listed on the left. By selecting an asset, further information is provided: a description, buy and sell orders, the quantity etc. My Assets: This page will list all the assets in your possession: both those issued by you and those you bought from the exchange. Issue Asset: A window will pop up allowing you to issue your own assets into the exchange. This function is currently available on the Ignis child chain only. 1. select the asset from the list of assets you have added by their asset ID. 2. quantity: define how many tokens you are interested in buying. 3. price: set how much you are willing to pay. ATTENTION: "price" refers to the cost of a unit of tokens. So, by entering 10, you are willing to pay 10 Bitswift per token. 6. it will ask you for your passphrase and finally press buy asset. 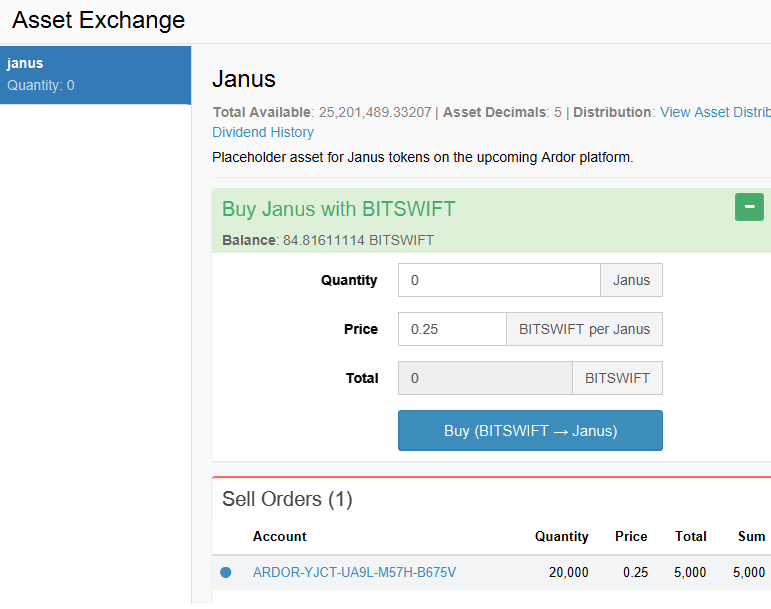 An example of buying Janus asset on the Bitswift asset exchange. Under My Assets, find the asset you wish to transfer. RECIPIENT: the account you wish to transfer the assets to. Mandatory: this field is mandatory. COMMENT: you can attach a brief commentary to the transfer. Constraints: Optional: this field is optional. Characters allowed: it can contain any Unicode characters but should be URL-encoded. Maximum length of 1000 characters. QUANTITY: specify the amount of assets you wish to transfer. Constraints: Mandatory: this field is mandatory. Limits: there is no upper limit, you can transfer all your assets. The minimum amount you can transfer depends on the nature of the asset. In particular it depends on what has been defined as decimals. For 0 decimals, the minimum would be 1 token. For 1 decimal, it would be 0.1 tokens and so on. FEE: set the fee you are willing to pay for the transaction. Constraints: Mandatory: this field is mandatory. Limits: there is no upper limit. However the minimum fee is 1 NXT. DEADLINE: set how long you are willing to wait before the request gets automatically deleted. Constraints: Mandatory: this field is mandatory. Expressed in hours SECRET PASSPHRASE: enter your passphrase. 'Constraints: Mandatory: this field is mandatory. Under this menu you can see all your orders that are currently open. The process is not instantaneous. Your cancel order is broadcasted to the network, it may happen that your order gets accepted before you can manage to cancel it. The process of creating and canceling an order is a transaction, meaning it involves a fee. An order in the process of being canceled will appear in red under your Open Orders menu. Under this menu, you can issue assets yourself. These will be publicly available on the Asset Exchange where they can be traded for Bitswift tokens and vice-versa. NOTE: as the warning mentions, when you issue your asset you will not be able to modify any of the fields, ever. Reason why it is imperative to make sure all the information entered is correct. Mandatory: this field is mandatory. Limits: you can set from 0 to, at most, 8 decimals. The latter corresponds to the minimum of 0.00000001 tokens. FEE: define the fee related to issuing the asset. To avoid spam on the Asset Exchange there is a fee. Constraints: Mandatory: this field is mandatory. DEADLINE: how long you are willing to wait before the request gets automatically deleted. Constraints: Mandatory: this field is mandatory. Expressed in hours PASSPHRASE: the asset belongs to the person issuing it. Therefore it is required to enter your own passphrase. It will not be broadcasted. Note: assets belong to the person that creates them, but they can be bought, sold and transferred. Constraints: Mandatory: this field is mandatory. This page was last edited on 8 January 2018, at 21:01.